My cheery, cherry tea is featuring some beautiful, handmade gifts that I received from my sweet blogging friend Stephanie, from The Enchanting Rose. Just look at my pretty apron, and guess what? It's reversible, too! Stephanie is the Queen of Embellishments, and her handmade items always have her special touches. 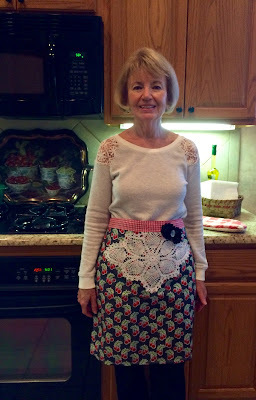 I love the apron's old-fashioned charm, with the pretty doily, and the soft rose trim. Aren't I lucky? 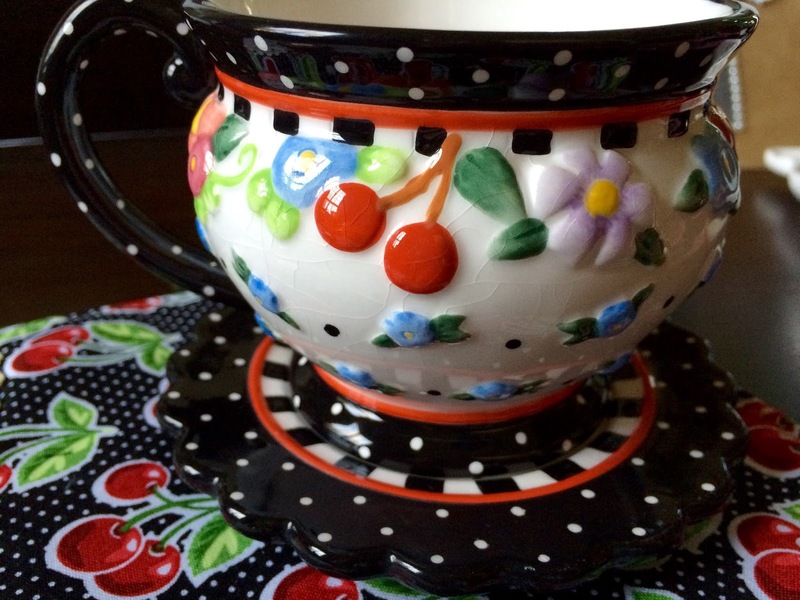 This pretty mug rug is perfect for my teacup and a snack. I moved my bowl of cherry crisp, so that you could see the beauty of the design. 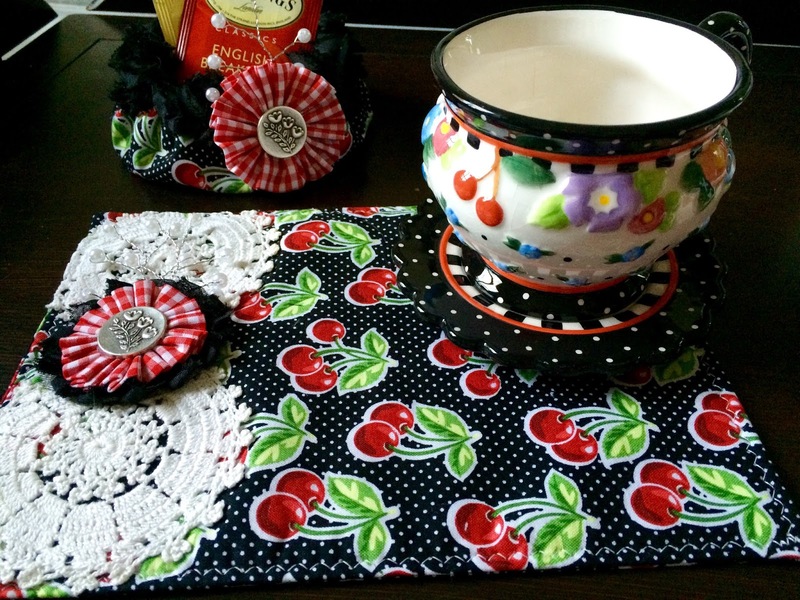 In the background is a darling fabric bowl, all embellished to match the apron and mug rug. My Mary Engelbreit teacup, from my friend Bea, looks so pretty on the mug rug, don't you think? 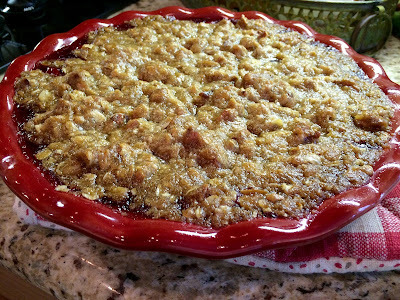 Here's my easy cherry crisp that I whipped up for the occasion. There's plenty, as you can see, so please join me, won't you? Now let's enjoy a bowl of easy cherry crisp, and we will drink some Black Forest Tea, that my friend, Margie, sent me, and oh my goodness, is it ever good! Preheat oven to 350 degrees. Lightly grease a 2 quart baking dish (I just used a pie dish). Pour pie filling into the dish, and spread evenly. In a medium bowl, mix together flour, oats, sugar, cinnamon. Mix in melted butter. Spread over pie filling, and sprinkle with chopped pecans. This lovely apron goes perfectly in my kitchen. Thank you, Stephanie, for your handmade gifts for me! 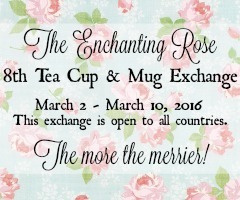 If you'd like to participate in Stephanie's next teacup & mug exchange, the information is below. You need not have a blog to participate. It's such a rewarding experience, and you can read testimonies from several ladies, by visiting here. 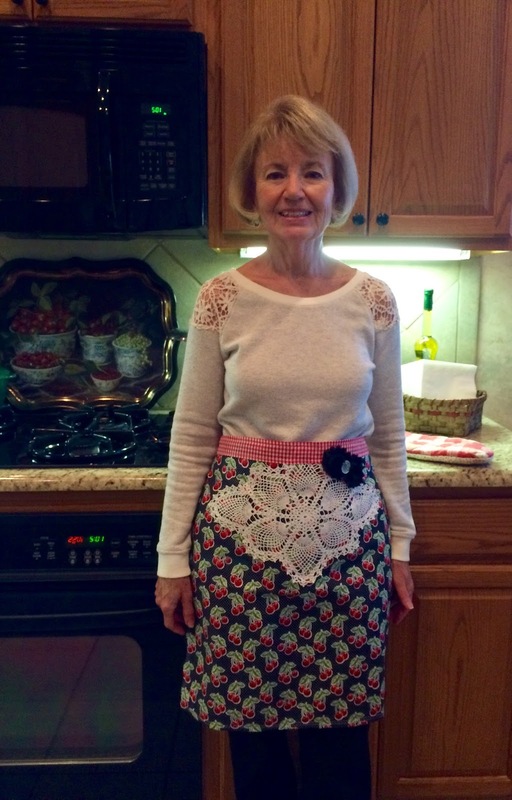 I love your sweet apron and I like how it coordinates with your top! What cheery cherry gifts, and a fun theme. I used to have cherries in my red, white and black bistro kitchen. The cherry crisp looks heavenly! Hope you have a great week Kitty. Good Morning Kitty, love your new pretties gifted to you from dear Stephanie. Love the darling cherry design and the apron looks so cute on you. The ME cup is so special. Oh how good your cherry crisp looks. Thank you for sharing the recipe with us. All these pretties are perfect in your home. Hello Kitty, how sweet of Stephanie to send you such pretty presents. I love your new apron! Thanks for sharing the recipe for Cherry Crisp at Cooking and Crafting with J & J.
I keep promising my hubby I will bake a cherry cobbler soon...you've inspired me! The apron looks lovely on you, Kitty. Stephanie is indeed a wizard with fabrics. I do like your Hello Kitty lunch box (perfect for you) in your darling sewing room and the dear teacup from your daughter in your previous post - forgot to mention that in my comment. What a darling apron you received and what a tiny person you are! I love it and that's because I love vintage too. The cherry fabric sure is cute and Mary Englebreit would love this posting for sure! So glad you shared your sweet table with us and that Cherry Crisp. Everything looks delightful and oh how I would LOVE to have some cherry crisp with you. My husband is a cherry lover so this recipe is a must to try soon. I shall bake it in honor of you. It was my joy and pleasure to send your a little something for your special day. After all, you make my life extra special with your friendship. Enjoy your week! Everything is so perfectly complementary. Stephanie is a sweetheart and that apron is lovely! Aw, Kitty, what a darling apron! It looks like you, adorned with the cherries. The cherry crisp looks wonderful and your ME cup is perfect for the tea today. I have some of that Black Forest tea too from Margie. So glad you shared with us and have a lovely week, my friend. Your sweet gifts from Stephanie made me smile, Kitty! The fun cherry design matches your cute Mary Engelbreit mug perfectly and the apron will be put too good use your Cooking Camp. I'm sure that the Black Forest tea complimented your cherry crisp perfectly! Your apron from Stephanie is adorable on you! I love the cheery cherry theme here! So sweet! 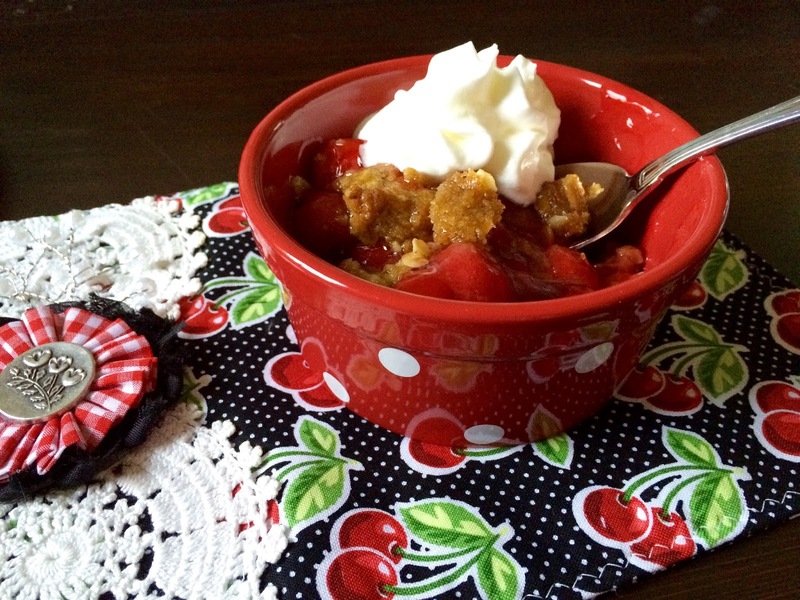 The cherry crisp sounds delicious and easy so it's a win, win recipe for sure. I love cherry anything! Hope you are having a wonderful week! Ps looking forward to the swap! Kitty, you look adorable in the lovely cherry apron. Yes, you are lucky to receive such sweet gifts. Love the Mary Engelbreit mug. I would love to join you for tea and a dish of your fabulous Cherry crisp, yum. Thanks for the recipe…….Happy week. How utterly delightful, Kitty! Your gifts from Stephanie are just soooo YOU!! The colors, the theme, the thoughtfulness that she put into creating them makes them very special. I'll have to look for that tea & when I find it, I'm making some of your cherry crisp to go with it. Thanks for the recipe! Oh Kitty..I am swooning over every photo and this wonderful recipe. Awesome post all around. That ME teacup is the 'ticket' for sure. You have been showered with some delightful and special gifts!! Thanks for sharing. The apron is absolutely adorable and you look darling in it! The mug rug is perfect along with your mug. Such a pretty table setting. Just darling!!!!! You look lovely in it!!! Cherry crisp sound yummy! May have to make that for the family! Everything looks lovely! Kitty, your place setting is adorable. I love ME and cherries so it's right up my alley. The apron is beautiful and you are a perfect apron model!My hubby loves all things cherry so this will go into my recipe box! Love your apron! The Cherry crisp sounds wonderful! Kitty, everything Stephanie makes is wonderful. The apron is darling and you look so darn cute in it. Everything looks so cute together and your cherry crisp looks delicious! Glad you'll be sharing with SYC. Stephanie is a sweetheart. Such a pretty apron and mug mat. Cherries are so delicious and the crisp looks scrumptious! Omy goodness...I just love cherries...to eat...to decorate with...and that apron is fantastic. Love you ME cup...an I just yesterday made a cherry pie. Love all of the cherry themed items and most certainly the special apron! It looks wonderful on you. Stephanie creates so many handmade treasures. We try to go cherry picking once or twice during the summer. In the meantime I look forward to making your cobbler. Looks like a nice comfort dessert on our recent cold nights. Yes, that apron fits right in! 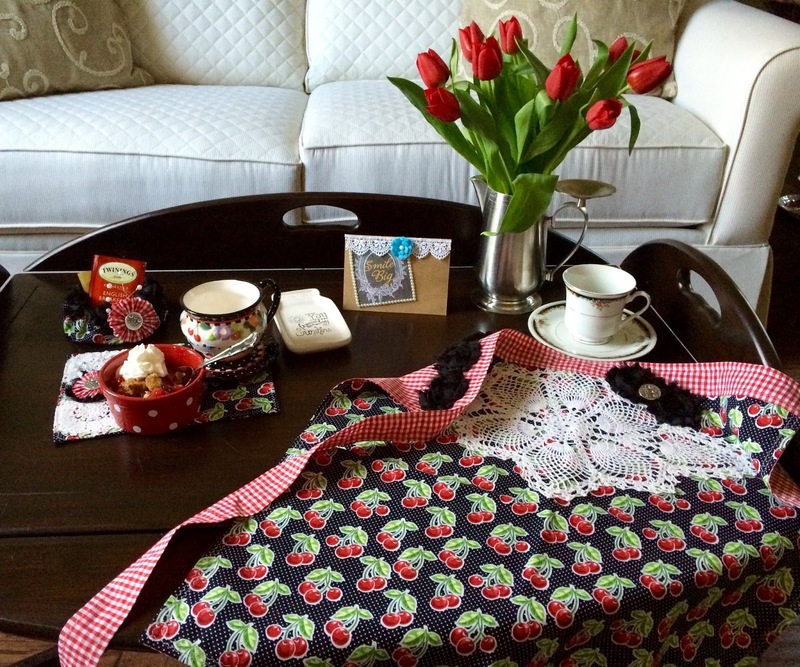 I love the title of your post and of course the cheery cherry cobbler and apron too! Thank you so much for joining us in Thoughts Of Home on Thursday! Life is just a bowl of cherries Kitty, and what a way to enjoy it with a bowl of homemade cherry crisp, wearing a cherry apron and drinking a cup of tea in a cute ME cup! Lucky you! Kitty- I love visiting your blog. Your spirit and creativity are a blessing to us all. Oh Kitty, what a darling post with darling things! I love the picture of you with the apron. Stephanie is just the sweetest thing and very talented. How charming! And that crisp looks delicious. Love your recipe! Thanks for your visit...I'm finally catching up on mine and my replies!! I love my new mixer...and it's the smaller of my 2 Kitchen Aids now. I have the 6qt lift bowl mixer, too. This new one, I can leave out on my counter, without it taking up too much room. I'm also going to order new decals for the large one, as soon as I figure out which ones I want, as it is charcoal grey. Have a great weekend. Just popped this delightful crisp into the oven and will enjoy some with a cup of coffee later this afternoon :) Thanks for sharing, sweet friend. Hope you are staying dry up there in our wet area. Your Crisp looks delicious, I just love a cherry crisp. Looking forward to seeing you again at Full Plate Thursday tonight!